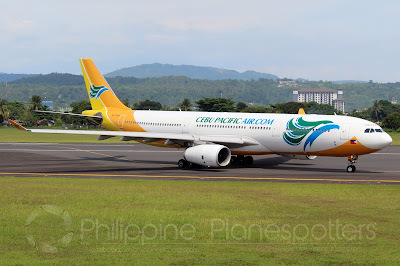 Aviation Updates Philippines – Citing a report from FlightGlobal, leading aviation analytics and insights provider, low-cost carrier Cebu Pacific Air is currently requesting aircraft manufacturers Boeing and Airbus for a proposal on its Boeing 787 and Airbus A330neo aircraft, respectively. EXPANDED WIDEBODY OPERATIONS. Cebu Pacific plans to double its widebody fleet as it plans to expand regionally. Photo by Dirk Salcedo - PPSG/AUP. Cebu Pacific Chief Executive Adviser Mike Szücs told FlightGlobal that it is already on its initial planning for the addition of up to 16 new widebody aircraft to its growing Airbus-dominated fleet. The Request for Information (RFI) was already sent out late-2018. “We are not doubling our widebody fleet to go and fly lots of places long-haul. Yes we will want to do long-haul, yes we may do the [US] west coast, but that is not our priority,” Szücs said. The airline executive emphasized how Cebu Pacific planned to utilize these jets on slot-constrained routes instead of deploying the new aircraft to more long-haul destinations. Although there are particular plans for new long-haul launches, the low-cost carrier will be focusing more on its regional expansion. The airline operates eight Airbus A330-300 aircraft fitted with 436 seats in an all-economy configuration. It is being deployed to long-haul routes in Australia and the Middle East. Moreover, the widebodies are also deployed key domestic and international destinations with high passenger volume. Presently, the Ninoy Aquino International Airport in Manila is heavily slot-constrained and will not be capable of receiving any more flights in the near future. To solve this problem, airlines are already switching to larger aircraft in exchange of fewer slots since this type of solution will fix both slot-constraint and passenger volume dilemmas. Cebu Pacific has repeatedly failed to sustain most of its Middle East long-haul routes because of continuous pressure posed by Philippine Airlines and Gulf carriers. It once served flights to Doha, Kuwait, and Riyadh. As of the moment, Dubai, Melbourne, and Sydney are the only long-haul routes for the airline serviced by the A330 fleet. hoping that Cebu Pacific will install low-cost business class in these upcoming widebody aircraft.